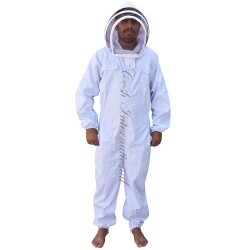 Our heavy duty beekeeper suits and jackets will keep you safe and protected at all times. Featuring several different veil designs including the very open fencing veil and the round veil design, our bee jackets and suits allow full head and face protection while allowing great ventilation and visibility. Our heavy duty beekeeping suits and jackets come in several different sizes including youth sizes for children. We Experienced In This Line. For Samples Or Trial Small Order, We Can Send Them To You By Air Express, Such As DHL, FedEx, UPS, TNT Or EMS. For Large Amount Goods, We Can Book The Ship To Your Sea-Port By Sea-Shipping. For Small Order Or Samples , Within 2 Work Days After Received Your Payment. For Big Order (More Than 100pcs), One Week After Received Your Payment.For Big Order (More Than 100pcs), One Week After Received Your Payment. We Accept L/C, T/T, Western Union, Paypal, Etc Payment. Details:Made Of 100% Heavy Cotton With Round..
. Details:Made Of 100% Heavy .. Details:Made Of 100% Fully Ventilated Mesh 3 Layer.. Details:Semi Ventilated Mesh 3 Layer Beekeeping Su..